A highly flexible Laravel 5.x scraper package. 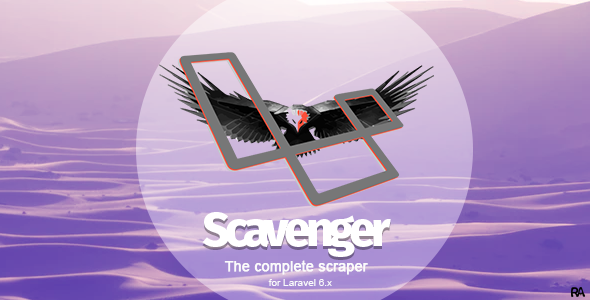 Scavenger provides the following features and more out of the box. Scavenger is super-easy to configure. Simple publish the config file and set your targets. Scrape data from multiple sources at once. Convert scraped data into useable Laravel model objects. eg. You may scrape an article and have it converted into an object of your choice and saved in your database. Immediately available to your viewers. You can easily perform one or more operations to each property of any scraped entity. eg. You may call a paraphrase service from a model or package of your choice on data attributes before saving them to your database. Scavanger uses a hashing algorithm of your choice to maintain data integrity. This hash is used to ensure that one scrap (source article) is not converted to multiple output objects (model duplicates). Once scavenger is configured, a simple artisan command launches the seeker. Since this is a console command it is more efficient and timeouts are less likely to occur. Scavenger can easily be set to scrape on a schedule. Hence, creating a someone autonomous website is super easy! The following words may appear in this documentation. Daemon: User instance to be used by the scavenger service. Scrap: Scraped data before being converted to the target object. Target: Configured source-model mapping for a single entity. Target Object: Eloquent model object to be generated from scrap. This package is heavily inspired by and dependent on the Guzzle library, although several concepts may have been adjusted.